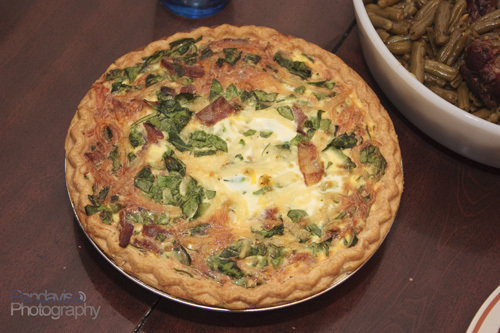 The other dish I made for Easter Brunch was a Spinach and Bacon Quiche. 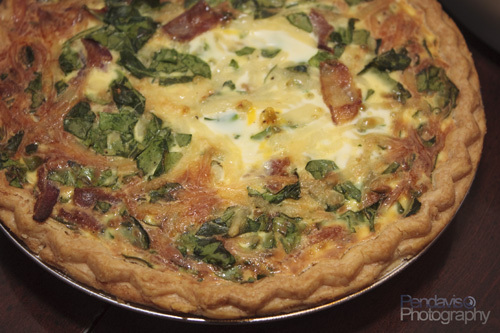 I had never made a quiche before but I have had some pretty good ones. Particularly the one I sampled from Bluebird bakery, which was one of the best I have ever tasted. I again forgot to take pictures of the process and I promise I will do better in the future. didn't have heavy whipping cream like it called for. I had half and half, and it didn't seem to make much of a difference. I added one cup of half and half and a half cup of sour cream because I saw it in a different recipe. I thought it would help me with not having the heavy cream. One of the biggest problems I had was the bacon. I had intended to cook the bacon the night before but forgot, and then intended to cook it in the morning and again forgot. I didn't want to cook it in the oven while I was cooking another dish (the French Toast Casserole) because didn't want the bacon altering the flavor of that dish. So I had to wait the 40 minutes for that dish to be done before I could make the bacon. My wife brilliantly suggested that I microwave the bacon, which is what we did (but not before being frustrated by the limited grill capacity of a George Foreman.) and that turned out fine. In the future I will always consult my wife on bacon related matters, as she considers herself to be quite the expert on all things bacon. Another issue was the spinach. The recipe called for 2 cups of packed spinach. I only went with one, and that was mostly because I cut up and packed a cup of spinach and saw that it looked like more than enough. In fairness to Paula Deen I was pretty uncertain of what she meant by the term packed. I also used Garlic salt instead of regular salt that the recipe called for. I made no changes to the baking process. I threw it in the oven for 35 minutes at 375. It baked up pretty nice and fluffy. I give this dish a 4.5 out of 5 broken eggs. It was very tasty. I was a little concerned that the center seemed a little looser than I wanted it to be. The crust I chose also seemed a to not flake up the way I wanted it to. 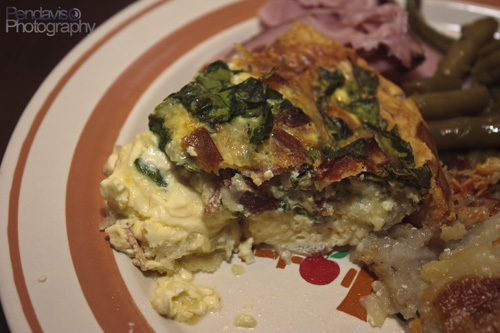 I liked the mix of spinach and bacon. It wasn't quite as excellent as Quiche's I have had from others but I would definitely try to cook it again. Although we microwaved the bacon it came out great and didn't make a difference in the overall taste of the dish. The family loved it and we even got my sister's boyfriend to try it even though he had never had quiche before. he best part of it was that I had plenty left over for breakfast for the next week. I microwaved a slice every day and learned to really appreciate having such a quick and scrumptious breakfast.